Jason Hogan loves Lanier National Speedway. He just can’t seem to win at the 3.8-mile track, at least since he’s become a full-time racer. That isn’t to say that he hasn’t come awful close a whole heck of a lot of times. Such was the case on Saturday night at Lanier, when the Southern All Start Super Late Model touring series headed to Hogan’s hometrack for a 150-lap shootout. That move might have proved costly for Hogan. At the end of the night though, Hogan came one-spot and just a few feet from sweeping the night’s events, finishing second to Dave Mader III. The weekend started out right for Hogan. He was quick in practice and backed it up in qualifying, grabbing the pole. 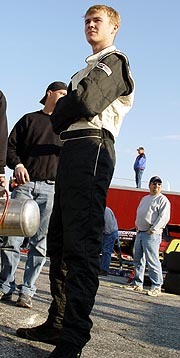 Hogan then spotted for friend Richey Etheridge in the Pro Late Model race before the Super Late Model feature, guiding Richey to the 125-lap feature win. Hogan and race leader Jeremy Rice traded the lead a few times during the night, once when Hogan pitted for fresh tires just before the halfway mark. Hogan made his way back to the front after pitting for tires, but he couldn’t pull any distance on Rice. He eventually fell to third after Mader passed him, but became a beneficiary to the hard racing on the last lap. “(Jeremy) had a good racecar. One of the better racecars I’ve seen him in down here,” said Hogan. “I knew that if I got up behind him, I could get by him, but I knew he was going to hound me the rest of the time I was there. I just slipped up there one time and he got back by me. getting blown by by the ole #118. I thought I was going to give them a run for it there at the end, but the car didn’t go like I wanted it to. So I just laid back and gave myself enough room in case those guys got into it. Of course, that happened. I thought I almost got by the both of them. 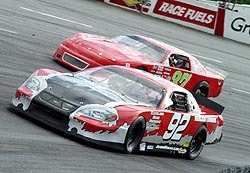 Matt Hawkins finished fourth in Saturday’s race at Lanier National Speedway. In his last few attempts, Hawkins has been unable to complete races, due to either mechanical failure or incidents on-track. Not this time though. Hawkins lasted the whole race, driving smart and coming home with a solid top-five run. “This is great,” said Hawkins after the race, breathing a huge sigh of relief. “There isn’t a scratch on (the car) finally. Maybe the lucky charm was new crew chief Jody Wilkerson. Wilkerson, a former ASA veteran crew member, prepped the car well. Many drivers were a little more than disappointed to see only 13 Super Late Models in attendance at Lanier on Saturday. “We don’t know where the cars are,” said SAS owner Ben Atkinson at the drivers meeting on Saturday. Some of the biggest names weren’t around that normally show up for Southern All Star races. Absent were the likes of Gary Helton and Charlie Bradberry, both of which are planning to run full-time in the NASCAR Southeast Series this year. Ricky Turner was a no show. 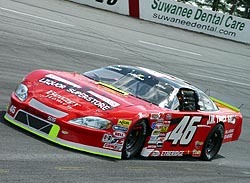 In fact, Johnny Brazier was driving an old Ricky Turner car at Lanier. Wayne Willard has moved onto the Pro Cup Series and is building a Super Late Model, but hasn’t gotten it ready, but will likely just run the All American 400 and Snowball Derby with it. Dave Mader showed up, but none of the Concord Motorsport Park Big 10 Series regulars made the less than three hour trip to compete in the race that paid $5,000 to win. 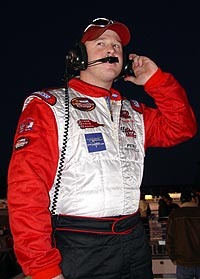 In a list compiled by one fan, of the eight major Super Late Model events in the Southeast in 2005 heading into Lanier (those races include two at Birmingham, two at Montgomery, one at Concord, the Pensacola/Mobile double and the Rattler at South Alabama, but not including the preseason SpeedFest or Speedweeks), a total of 91 different drivers have competed in at least one event. Charlie Bradberry and Eddie Mercer had run seven of the right, each just skipping out on Concord. 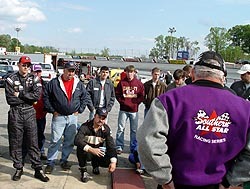 SAS owner Ben Atkinson (right) talks with several of those gathered at the drivers meeting. However, the average car counts have been in the low 20s. 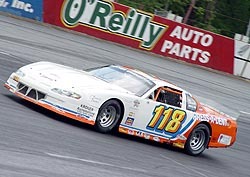 In fact, only the Rattler brought in more than 30 Super Late Models. With races paying $5,000- and $10,000-to-win, there is some question as to where the cars are. But it is a question that has been posed before and will likely be debated for some time to come. But for now, Super Late Model racing in the Southeast is struggling. That is the lone fact. 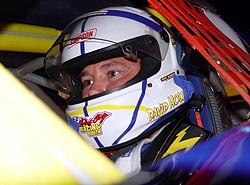 David Hole is arguably one of the best Super Late Model drivers in the country. There is no doubt to that. However, his luck at Lanier has been pretty bad. Pretty bad? Really bad. Hole didn’t have a great race, but he’ll take the third-place finish. He pretty much just rode around to save his tires to make a run at the end. But the tires didn’t matter. They fooled him, as did Jason Hogan. “Jason and I both pitted and that was the wrong move. I was just taking my time and saving my tires. I saw TJ (Hogan) come in and get some timers around lap 75. We were trying to keep up with how he was doing, and when he passed me, I thought (getting tires) must be good. So we came in and pitted, but the second set wasn’t very good. I was tight and loose. I just rode for a while after that. Lucikly though, he came in. Dave Mader III took a little lesson he learned in 2004 to win the race on Saturday night. “We stayed out, just like we did tonight, last year,” said Mader. “(Ricky) Turner won, Willard was second and I was third. We didn’t pit last year. Willard was the only one that did and came back up to have a good finish. But Turner and I stayed out last year and it worked then. “I knew we didn’t pit last year and we weren’t going to pit this time either. We just wanted to take the chance. Dave Mader learned from his race at Lanier in 2004. It look Richey Etheridge just about 30 laps to get from third to first on Saturday night in the Pro Late Model 125-lap feature before the Southern All Stars event. The next 85 laps were all about dodging lapped cars. That was about all he had to worry about. Second and third place were no where to be found. There was one time when Etheridge came up on four lapped cars, running two-by-two in front of him. He eventually made it around all four, but not before there was plenty of contact between all of them trying to stay on the lead lap. After that, it was just about waiting out to the checkers. He might just be able to thank his spotter too; Jason Hogan. 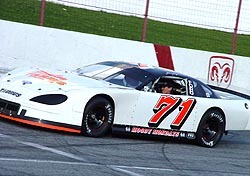 It isn't very often that you've ever seen veteran Super Late Model driver Johnny Brazier in anything but a red #71. That wasn't the case this weekend at Lanier. Brazier showed up with a white #71. "I've had a couple black cars years ago, but normally, the car is red," said Brazier. "I'm not a big fan of white." So why was the car white? Johnny had a white car, here, scuffing his tires and getting ready for his qualifying run (hence, no helmet). with a different body they have in the shop. Therefore, they didn't bother taking any time to paint the car. They may want to get rid of it soon. The white body brought Johnny no luck, as he suffered mechanical problems in both the race and in qualifying, finishing 10th.